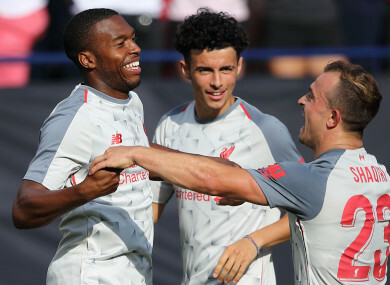 Liverpool ended their US friendly tour on a high with Sturridge and Shaqiri providing a decisive impact as second-half substitutes, Sheyi Ojo’s cool penalty helping secure bragging rights and three ICC points in front of a gigantic 105,000 crowd at Michigan Stadium. Sadio Mane hit the winner from the penalty spot as Liverpool beat Manchester City 2-1 last time out and the Senegal star was on target from 12 yards again to open the scoring after Mo Salah was fouled. Email “Super Shaqiri bicycle kick helps Liverpool trounce youthful Manchester United”. Feedback on “Super Shaqiri bicycle kick helps Liverpool trounce youthful Manchester United”.